Whoever said that good things happen to those who wait definitely hasn’t watched Discovery Channel’s show “Fast N’ Loud.” The show features Dallas-based shop Gas Monkey Garage (GMG), where Aaron Kaufman and the rest of the crew struggle through every episode to finish vehicles for Richard Rawlings’ (GMG owner) ridiculous deadlines. To maintain a steady flow of work, Richard puts the crunch on the guys to roll projects in and get them out the door in order to get paid. Last time we visited GMG, the guys had just finished a ’65 C-10 that was a pace vehicle for the historic Pikes Peak International Hill Climb. This truck was brute force with a 572-cid Chevy V-8 backed with a Tremec T56 manual transmission. The truck had plenty of performance to make it up the hill and to complete the entire course. It was all guts and no glory; it ran solid but still had the original patina. The ’65 was a smash hit with fans of the TV show, but the GMG crew knew they could do something better. 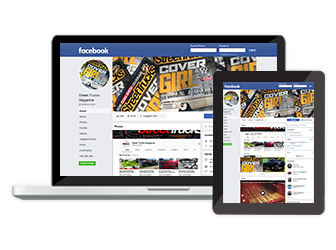 You see, the majority of the guys who work there have deep roots in the custom truck scene and knew that they were capable of so much more. Most of all they wanted to prove to the world that they had the talent to compete with the best. A build was going to happen eventually; it was just a matter of time. 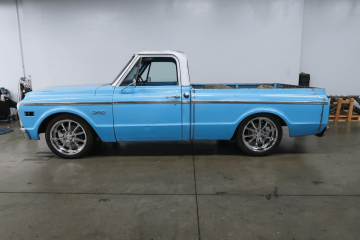 As luck would have it, Richard purchased a building down the street from the shop and this ’76 C-10 came as part of the package deal. Originally it was a truck from California, which has a dryer climate with less humidity than the rest of the country. 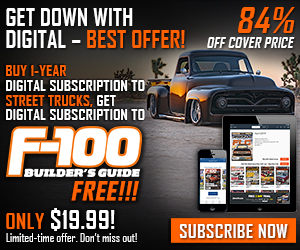 This is key when looking for classic truck projects, because vehicles from the West Coast are generally less prone to rust, or cancer, as we like to call it. When the crew was made aware of the C-10, they quickly made their case to Richard to allow them to have their way with it. Richard just happened to be in a good mood and told them he wanted it to be the nicest thing they’ve built, but they would only have one month to finish because it was going to be donated to the Cattle Baron’s Ball in Dallas and auctioned off for charity. 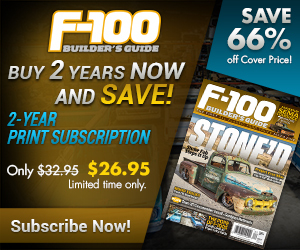 Going into it, the C-10 was a blank canvas and the guys could have done anything with it. This ’76 C-10 was a good find; no major rust issues made it a great “canvas”to turn into a work of art. 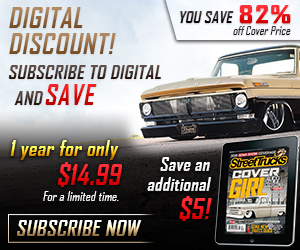 Currently, the biggest thing in the C-10 community is the restomod style. Restoring or leaving the body factory while upgrading the drivetrain and suspension is where it’s at these days. It seemed like the best formula, plus it’s relatively straightforward with many vendors catering to vehicles like this. Like all the other builds, there was no rendering; it was just go time. The crew started to break down the truck while the parts were being ordered. With the frame stripped of everything, the suspension was upgraded with Porterbuilt Fabrication’s Level 3 front and rear Dropmember kits. 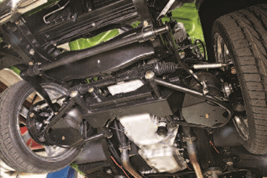 These components allowed for the use of airbags to lay the frame on the ground. This included a front cross member, control arms, transmission cross member, rear frame notches and bridge and a 4-link with pan hard bar. 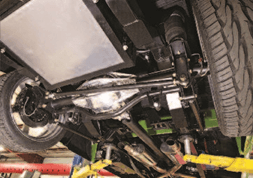 The suspension also utilizes Classic Performance Products spindles with 14-inch wildwood disc brakes. The height of the vehicle is now controlled by use of AccuAir’s E-Level air management system. Next, an LS7 engine with wet oil sump system and 4L85E transmission was ordered from ScogginDickey Parts Center. Though the engine came with a Stage 2 camshaft, it was later enhanced with MSD coil packs, F.A.S.T. fuel rails and a 102mm intake that’s fed by a custom intake tube. On the other end is a set of headers from Hedman and an exhaust from Magnaflow. 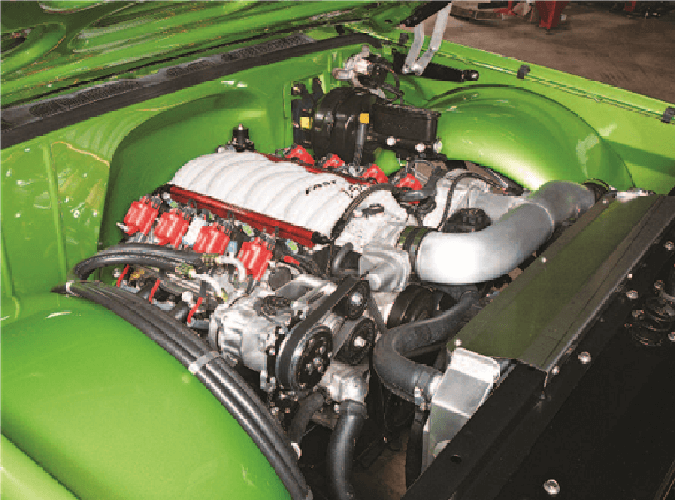 The power is then transferred to a Currie Enterprises 9-inch rearend with 3.55:1 gears. 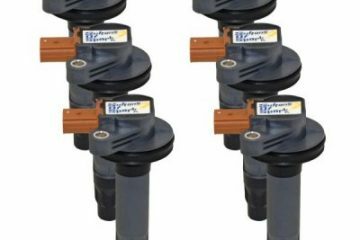 Fuel is supplied from a 20-gallon Aeromotive fuel tank. Keeping it cool is a radiator from Ron Davis and a set of SPAL electric fans. 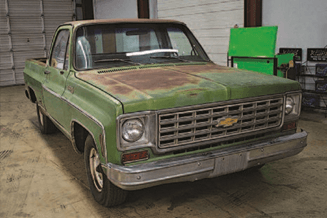 The body was restored to resemble the way these C-10s looked from the factory. There were some improvements in this area, but they were kept discreet. To make way for the wheel travel, the LMC Truck bed floor and tubs were raised, and a notch was added. In the front is a set of new fiberglass inner fenders by Slosh Tubz. The fuel door and stake pockets in the bed were shaved and the handle on the LMC Truck tailgate was flipped. Blazer tailgate trim from LMC Truck hides the hole where the handle used to be. K.C. 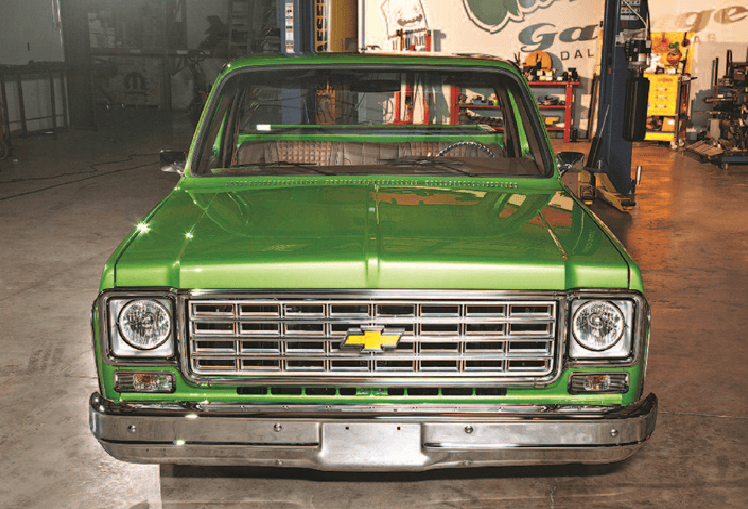 Mathieu worked the body smooth, and afterwards, he painted the truck in the original Medium Lime and added a Polar White stripe. New bumpers were ordered from LMC Truck to make it shine once again. Taking care of the details, the side trim and lighting came from Brothers Trucks. Completing the look on the exterior is a set of 22-inch Intro Rally Grooved billet wheels with Toyo Proxes ST II tires. If you take a peek on the inside of the truck, you’ll notice that it’s quite a spectacle. 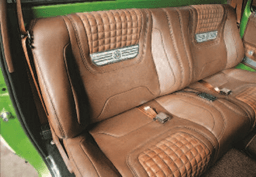 Leatherseats.com built the majority of the interior with design help from Hix Design. Starting with the floor, it was covered with highloop carpet and mats. 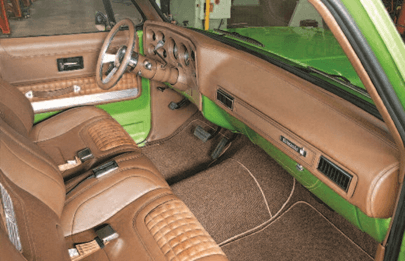 The original dash pad, door panels and bench seat were modified and covered in Italian Ecstasy leather and Nubuck suede. Kyle Hix and Aaron Kaufman work on interiors. Classy Nubuck leather bucket seats! Unique duffle bag by Hix Design. Setting off the seat and door panels are custom trim pieces and badges machined by Tyson Lamb of Black Diamond Design. 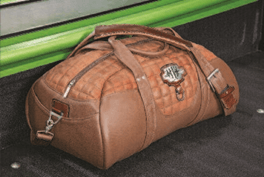 Hix Design even made a duffle bag that matches the upholstery. For creature comforts, a Vintage Air AC unit was installed to keep cold air on the inside during hot summer days in Texas. To make the truck drivable, a set of Classic Instruments C-10 gauges have been installed. Below them is an ididit steering column with a steering wheel to match the wheels. The truck was finished right on schedule and is one hell of a nice ride to have been built in only four weeks. As planned, the truck was donated and Richard’s friend Dennis Collins ended up purchasing it at the auction for $85k. 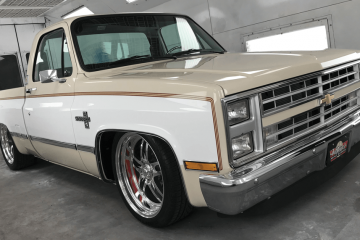 The truck later made its public debut at the ’14 SEMA Show. Just recently, it was rolled across the block at Barrett-Jackson in Scottsdale, Arizona where it fetched $41,000. 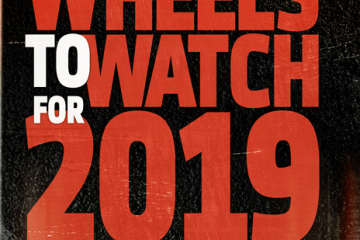 Now that the truck has come and gone, we’ll just have to wait and see what the guys at Gas Monkey Garage have up their sleeves next. 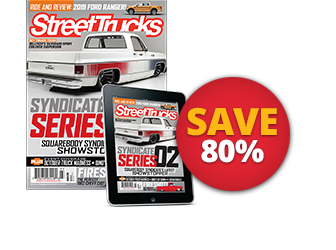 Editor’s Note: A version of this article first appeared in the April 2015 print issue of Street Trucks Magazine.